What if we change our minds during a divorce? After you and your partner decide to end your relationship, you both my regret the decision and question whether you really want a divorce. If you reach that point, it’s important to know if you can reverse your decision once papers have been served and divorce proceedings are in process. For couples who decide to reconcile before their divorce is complete, it’s entirely possible to halt the divorce process at any point, right up until the divorce has been finalized by the court. The state of Washington also imposes a 90-day “cooling off” period before a dissolution is granted, so there is a fair amount of time available should you change your mind. However, there are some rules to the process, so you should talk to your family law attorney as early as you can to get started with a dismissal. If divorce papers have been served and the recipient has responded, you will need to file a petition asking the court to grant an order of dismissal. Both the person who initially filed for divorce and his partner (the respondent) must approve the dismissal, or it will not be granted. This protects the legal rights of the respondent partner because this response to a divorce is actually a legal claim all its own, in the form of a counterclaim to the original petition for divorce. It also allows either partner the ability to get a divorce without the consent or permission of the other. However, if the papers have not yet been served, or the recipient has not yet responded, it may be possible for the person who initially filed for divorce to unilaterally (without needing permission from the respondent) dismiss the divorce without needing the consent of the other partner. Similarly, if the respondent has only replied with a notice of appearance and has made no other legal answer or counterclaim, a unilateral withdrawal may be possible. It’s not enough to simply ignore the divorce papers once they’re legally served. If the respondent is served but fails to answer and no petition for an order of dismissal is made, it’s possible that a default judgement could be made by the court, granting the divorce on the terms requested in the initial filing. In some cases, if nothing is heard from either side in the case, the court clerk may issue a warning that the case will be dismissed, but this could incur additional fees. If you and your partner are considering divorce but neither one of you has filed, you may consider a legal separation first. A legal separation in Washington imposes a six-month period of waiting during which you cannot file for divorce. This is an option that some couples choose to grant additional time to either attempt to reconcile or to disentangle their lives and finances from one another. Once that time period is up, a simple motion can then be made to the court to formally dissolve the marriage, since the terms have already been agreed upon as a part of the separation process. 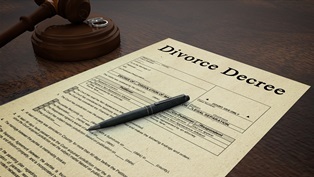 Many legal separations do end in divorce. However, if you do successfully reconcile, the marriage can continue. Once the divorce is finalized by the court, you are no longer married, and the divorce cannot be undone. If you’ve reconciled with each other at this point, you have the option of re-marrying your partner. If you and your partner have begun the divorce process but think you’ve made a mistake, talk to a family law attorney to determine your options. The attorneys at the Law Offices of Molly B. Kenny have experience handling unique and challenging divorce cases, including high-conflict divorces and divorces where significant assets are at stake, and we’re here to help you move forward with your life. To arrange a private consultation at our Bellevue location, call us by phone today, or use our online contact form to send us an email.